One of my favorite things to do on a Saturday morning it to sit with a cup of tea and look through decorating books (and crafting books of course). I usually have a large stack of decorating/interior design books from the public library right next to my chair where I sit by the window with my tea. 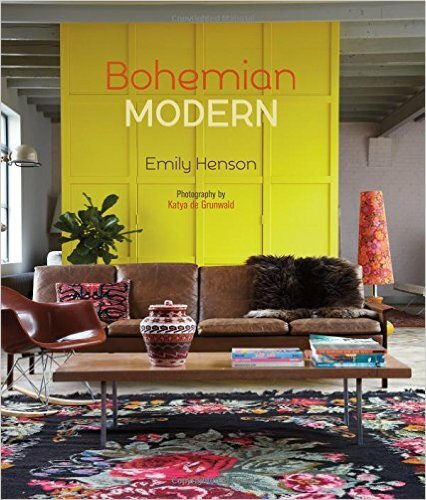 I recently finished an awesome interior design book called Bohemian Modern by Emily Henson. Contained in its pages was a wonderful title to one of the book’s chapters: “Creativity Before Consumption”. This quote has resonated with me and I want it incorporate it into my general philosophy of life. I think I do already with how much I enjoy working with recycled materials and fabric scraps. I did recently implement this concept in regards to my front door. I have disliked my plain white front door for a long, long time. I priced at the home improvement stores what it would cost to replace it and the cost has discouraged me from changing it out. The white door was just not aesthetically pleasing and I have been looking at it everyday for the 10 years we have been in the house and it does not make me happy. A radical (but simple idea) fell upon me – what about painting it another color?!?! (and why did I not think of this years ago?!!?). So I bought a can of black paint and painted it today! Below are the before and after photos. I hope you agree the black looks better. I am very pleased with my “new” front door! A $8.95 can of paint was a much lower expense than a new front door (whose costs would have included the door plus professional installation!). Yes, I think this is my new motto: Creativity Before Consumption! Ha – that is great! Sometimes consuming is good! I will refrain from revealing that I liked the white color better 😉 but I do like your thoughts and the new motto! You will have to just trust me that in person the black door looks much much much better. It makes a huge change to the room/entryway. The photos do not do it justice (plus I had bad lighting). I’ll *pretend* not to believe you, just so I’ll have an(other) excuse to come see it for myself!